A Laughter Club is a social platform where people get together to practise laughter and breathing exercises for the health benefits of prolonged laughter and also to meet new people. Mission Statement: To promote: Good Health, Joy, and World Peace through Laughter. 3 important guidelines: Non-profit. Non-religious. Non-political. 3 attributes of beneficial laughter: Unconditional. Hearty. Extended (15-20 minutes). 1. Laughter Yoga is a new concept where anyone can laugh for no reason at all. We don’t need any jokes, sense of humour, or comedies to laugh. 2. We do laughter in a group as a form of exercise in the beginning, but when we look at each other, having eye contact with other people, laughter becomes real and contagious. 3. The reason we call it Laughter Yoga is because we combine laughter exercises with Yoga breathing. That brings more oxygen to your body and brain, which in turn makes you feel healthier and more energetic. 4. Even if you laugh for the sake of laughing, your body doesn’t know the difference. You get the same health benefits. 5. The concept of Laughter Yoga was started by a medical doctor from India, with just 5 people in 1995. 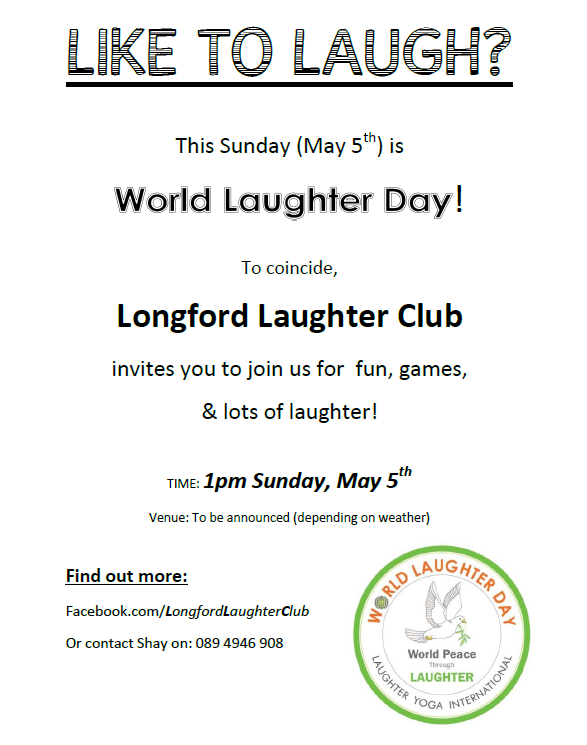 Today there are more than 6000 laughter clubs in over 65 countries worldwide.